Attacks are moving from the internet to the streets - with women and refugees among the most targeted. A leading hate monitoring group has reported a worrying shift in the nature of Islamophobia in the UK. Tell MAMA, who track Islamophobic hate incidents, report that two-thirds of verified incidents are now occurring offline, or on a ‘street-level’, including physical attacks and threatening behaviour. It marks a total reversal of previous trends. The findings follow the release of a shocking video last month, which saw a 15-year-old boy grabbed by the neck and thrown to the floor, at a school in Huddersfield. Refugees are now particular sources of Islamophobic hate, according to the monitoring organisation. Tell MAMA’s new report on Islomophobic hatred recorded a total of 685 (608 verified) incidents between January and June 2018. Women still make up the majority of these offline victims. The service say the shift to physical attacks represents a ‘complete reversal’ compared to five years ago, when the majority of reported cases were online. The past few years have also seen a rise in actions against Muslim faith institutions and property, with mosques being targeted. The highest number of incidents took place within public areas such as parks and shopping areas; the second most common place for incidents was public transport networks, such as trams, buses and so. 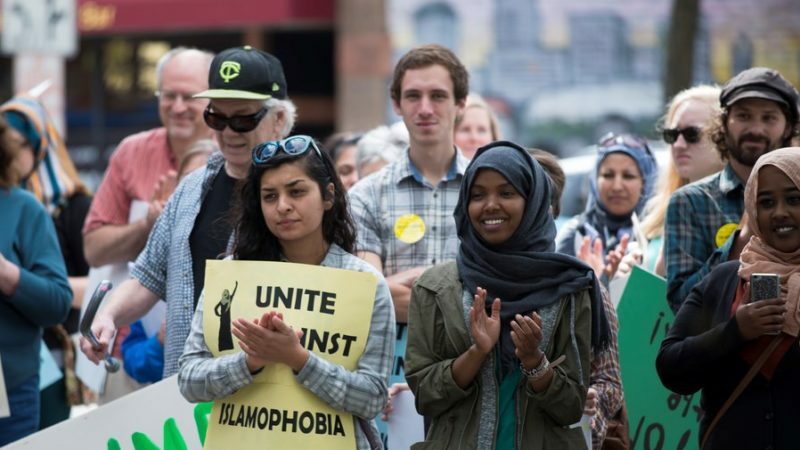 The monitoring group’s report on Islamophobic attacks comes as the All-Party Parliamentary Group (APPG) on British Muslims suggests a new definition of Islamophobia this week. Previously figures on the right have dismissed even the existence of Islamophobia. “The gendered intersectionality of anti-Muslim or Islamophobic hate incidents are now well documented through our extensive work. “Being a woman and being Muslim are markers for some of this gendered Islamophobia and not a single year has gone by since 2012 when we started work, when the majority of victims of street-based hate crimes have not been women. The findings come as the far right mobilises across the UK. But on Sunday 9th December, left-wing activists will march against the ‘politics of hate’ at a Momentum demonstration against Tommy Robinson. Today Shadow Chancellor John McDonnell called on “all Labour members and anyone who cares about the future of our country” to join the protest. The Shadow Chancellor said Robinson and other far right figures “threaten the very fabric of our nation” and called on supporters to “stand firm against the poison Robinson is trying to inject into our politics”. McDonnell has accused Robinson of leading a “newly energised, well funded network of hate”, saying that “the working class of Britain have a proud history of beating the far right” and that “this history must continue”. He called on the labour movement to be “front and centre” in opposing the far right. The march, organised by Momentum and a coalition of partners including London Young Labour, Labour Against Racism and Fascism and the Stop Trump Coalition, is set to take place in central London on 9 December.